Whether its Baked Pimento Cheese or Fried Pork Chops with Country Gravy, Southern-Style Collard Greens or Mama's Cornbread Dressing, the 200 recipes in this book are all kitchen-tested and family-approved! It's time to South Your Mouth, y'all! Delicious, down-home southern cooking has never tasted so good! 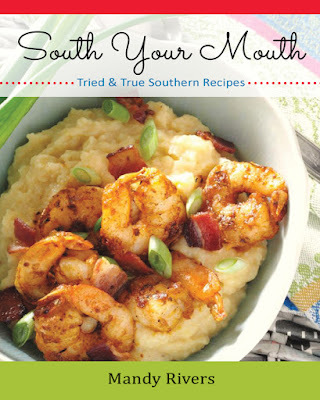 The second cookbook offers even more ALL NEW tried-and-true Southern recipes and funny stories as told the way only Mandy can. If you love to cook down home, simply delicious meals, these recipes are sure to become favorites your family will enjoy for years to come. 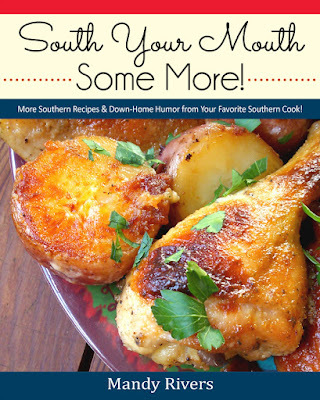 For information on carrying the South Your Mouth Cookbooks in your store or retail outlet, contact Melinda Burnham at Quail Ridge Press. YESSSSSSS! I know what my whole family's getting for Christmas!!! I can't wait till October. This is so exciting! I know what my sister is getting for Christmas - and hopefully me too! Mandy, PLEASE say that your cookbook will be available as a Kindle or iBook. I am paring my cookbook collection of paper books due to room and storage issues. I only buy dogtooth ebooks now and I SO want to purchase your cookbook! Mandy, I just received your cookbook. Most everything looks wonderful. I don't do chicken. I have a suggestion for your second edition or your next cookbook. Please advise approximately how much or how many each recipe makes. Any chance you'll be coming down to Atlanta? I LOVE your recipes! Everything I've made is amazing!! I was wondering if all the recipes in your cookbook have pictures?? I was wondering the same thing about pictures...did you get an answer? LOVE LOVE LOVE your cookbook! I ordered 5 to give to the females in my family for Christmas presents. We're all trying to cook our way thru your book. PLEZZZZ keep the great recipes coming. The dish is Shrimp & Grits. I love Grits! I have been looking thru your web page and girl you cook just like my Nanny did!!!!!!! Mandy, I love several of your recipes and want to print them off for personal use. We go to a LOT of potlucks and I would like to take the Strawberry Cream Cheese Icebox Cake. I saved the recipe but I like to include a picture of the recipe. Perhaps you could include the picture in the printer friendly version. I haven't visited the entire recipe section yet but do Intend to. Thanks. I have your cookbook and I love it so much I ordered 3 more and gave them as christmas gifts last year. Do you have any other cook books or will you be doing another cook books? Just ordered both cookbooks! Spent over an hour in the recipe section of your website and figured I couldn't go wrong. Planning Thanksgiving dinner around some of your "unique" dishes. Can't wait to start reading! will cookbook #3 be coming? Soon hopefully?